It has been nearly two months since I last posted an update on our Mexican adventures. I have no explanation for this hiatus other than the sense that time travels in warp-speed here; it is often I glance at the clock and wonder where the hours have gone. Oliver and I continue to spend a good deal of time walking and exploring and he shares my enthusiasm for new sights and sounds, always expanding our reach outward from the city center although the park continues to be our favorite place. The weather has been particularly enticing with chilly autumn-like mornings in the 50s, followed by a slow warming into the high 70s by mid-afternoon. The rains that accompany summer have waned, replaced now with autumn breezes adding to the allure of our postage-stamp garden to which I continue to add new plantings. And in addition to the normal routines of modern Mexican life, we have had our first houseguest and I have been to San Diego and back. Those of you who followed our adventures in the Republic of Panama (www.panamareality.com) may recall that during our 14 month tenancy there, our good friend Marie was our one and only visitor. In March of 2011 she traveled from San Francisco to Los Angeles and then to Panama City where we gathered her up for the hour and a half drive to our home in the mountains of Panama. We had a lovely time. Indeed, it was Marie who first encouraged me to start this blog and then made it all possible by her gift of this MacBook Air laptop computer and she continues to assist me with technical “support,” most notably my difficulty inserting photos. Thus it should be no surprise that Marie became our first (and so far only) visitor here in San Miguel. This time she flew from her new home in Portland, Oregon, to San Francisco and then on to Mexico City where a car and driver drove her the 180 miles northwest to our front door. She stayed eight days and we had a grand time; it was a delight to share with her the many sights and charms that San Miguel offers and she appeared to share our enthusiasm for our relocation. Since she is totally fluent in Spanish she was a great help with certain chores for which my rudimentary Spanish was not adequate (such as going with me to the cleaners to learn how to get just the right amount of starch in a shirt). We mostly stayed close to home, enjoying the August full moon at the Luna Bar, a rooftop terrace atop the Rosewood Hotel; dining well in an assortment of restaurants; and walking, walking, walking. 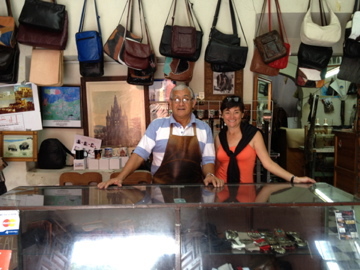 Here’s a picture of Marie with the “leather guy,” one of the many shopkeepers with whom she had spirited conversations in Spanish. Marie is an adventurous soul (if she hadn’t come to Panama we might never have taken the partial transit of the Canal), so while here in San Miguel she encouraged us to branch out; thus we took a major excursion to the City of Guanajuato. Birthplace of Diego Rivera and an historically important city in Mexico’s struggle for independence from Spain, Guanajuato is large (estimated population 1.5 million) and is the capital of the State which bears its name. Named a World Heritage Site in 1988, it is about 138 miles from San Miguel and we hired a van (which lacked shock absorbers) to take us for a day-long excursion. We were joined by Tom, one of our favorite neighbors, and it was a pretty drive through the countryside with occasional fields of wild flowers, both yellow and purple. Located in a narrow valley, the streets of Guanajuato are narrow and winding; indeed, many are alleys through which cars are unable to pass and the steep mountainsides are lined with lengthy sets of stairs. The origin and growth of the city came from innumerable silver mines in the mountains surrounding it and the city was one of the most influential during the colonial period. Many of the original mine shafts, active in the days when two-thirds of the world’s silver was found there, have become major thoroughfares, partially or fully underground, giving one a subterranean view. Our driver dropped us off a block from the historic center of the city, populated with numerous small plazas and gardens. Guanajuato is a university town and as we lunched at one of the many outdoor cafes surrounding the main garden, students ladened with bookbags ambled by along with school children in an assortment of uniforms. We were there on a Monday; alas, the one day of the week the museums are closed, so we limited ourselves to the various churches (including the basilica), the university, and the myriad paths and alleyways that wandered through the city center. 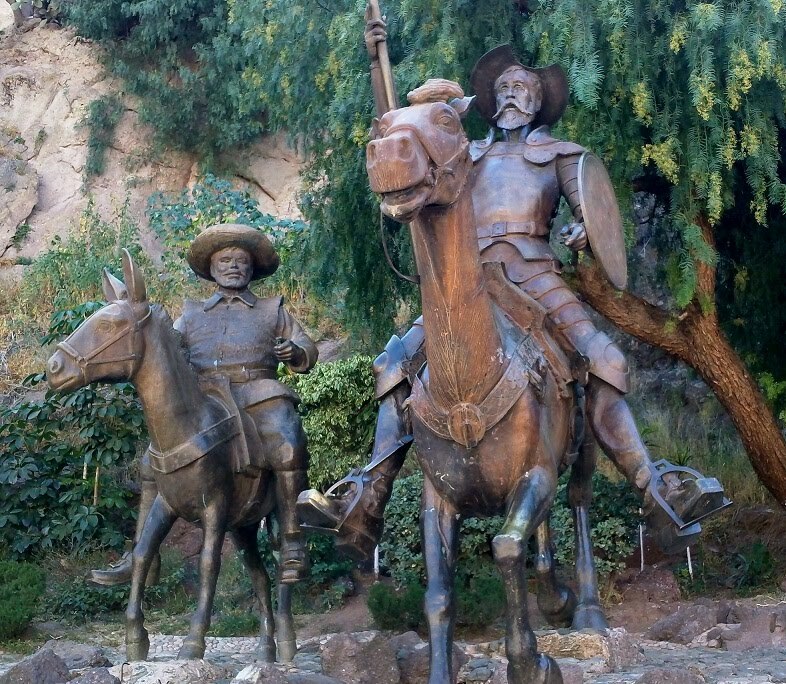 Cervantes was in great evidence with numerous statues and museums; we later learned that Guanajuato is host to the Festival Internacional Cervantino which has grown to become one of the most important international artistic and cultural events in Mexico. We had a lovely day there and it is a place we will visit again. Our trip to Guanajuato preceded by a few weeks the celebration of Mexico’s independence from Spain, one of the largest celebrations of the year. Beginning late in August, all of Mexico begins to prepare for Dia de Independencia, primarily by decorating homes and storefronts with the red white and green of Mexico’s colors; the Mexican flag was abundantly visible on every street and byway. On the eve of Independence Day we dined on the traditional meal of chiles en nogada, a poblano chili stuffed with meat and fruits (apples, pears, peaches) and spices, topped with a walnut-based cream sauce and garnished with pomegranate seeds. The green chili, the white sauce and the red pomegranate seeds reflect the colors of the Mexican flag. 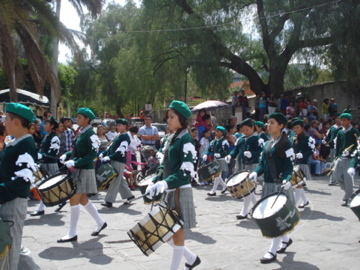 One of the main events of this two day celebration, Fiesta de Patrias, occurred later than evening when millions of Mexicans, Mexican-Americans and fellow revelers gathered in virtually every town and hamlet throughout the country to join a massive, synchronized call-and-response dating back to 1910, the 100th anniversary of Mexican independence. Each year on the night of September 15th, at 11 in the evening, the President of Mexico rings the bells of the National Palace in Mexico City. 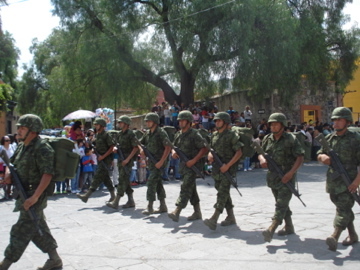 Similarly, at the same time, in every city and village and in all Mexican embassies and consulates worldwide, bells begin ringing after which the presiding official (in San Miguel it was the Mayor) calls out the cry of patriotism to those assembled, naming important heroes of the revolution. After each hero is named, the crowd responds in unison: VIVA! This call-and-response, known as el grito, ends with the threefold shout of Viva Mexico! Then church bells ring for several minutes followed by the mass singing of the national anthem accompanied by a military band. And then the requisite fireworks display. It was a marvelous experience. 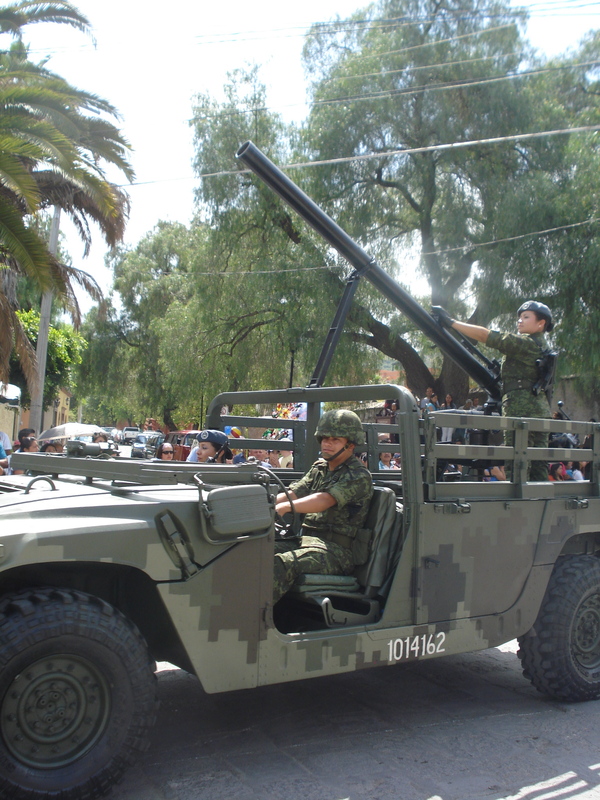 The following morning, Dia de la Independencia, began with a lengthy parade complete with multiple groups of school children, military troops and armaments and, finally, horses. Later in the afternoon, a reenactment of historical events took place with horses galloping into town followed by bands of peasants wielding machetes, all in period costumes. It was wonderful! 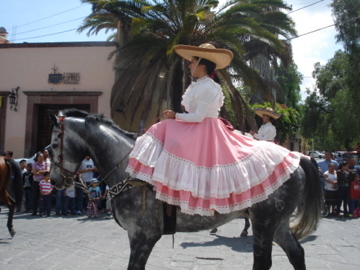 But then San Miguel is a party town and it seems there is always a celebration of one kind or another. For example, the populace is currently preparing for November 1st, the Day of the Dead or Dia de los Muertos. These last weeks of October are filled with cleaning and pruning gravesites and cemeteries and painting cemetery walls in preparation for the return of the spirits of the dead, carried by the wind. Marigolds seem to be an important part of this celebration, perhaps only because they are in bloom at this time of year; I’ll have more to report on this event in my next post. You never know who might arrive on the next gust of wind. And so it was that I arrived at my brother’s house in San Diego on a late September evening, having flown from Leon (70 miles from San Miguel) to Tijuana International Airport, a 3-hour flight. The airport in Tijuana is new and impressive but getting across the border was time-consuming since I stupidly scheduled my flight to arrive early Friday evening when hundreds of others were waiting to cross the border; I’ll know better next time. I had planned my trip to coincide with my sister’s birthday and we celebrated with a small dinner party at my brother’s home. I thoroughly enjoy being with my two siblings at the same time, a rare occurrence when I lived in Northern California, and our conversations ranged from the ordinary to the profound. I had a terrific time and saw both of my nephews, Erik and Lee, and my grand-neice Emma as well as “extended family” including Virginia, Sylvia, Marcella and Jack. After five days and before the first week of October had passed, I was home again in San Miguel, refreshed and renewed. And now I prepare to begin Level 2 of my Spanish studies, reportedly the most challenging of the levels, covering preterite regular, irregular and reflexive verbs, direct and indirect pronouns and word order. 24 hours of class time over a three week period with 6 to 8 hours of homework each week; I can’t claim to be looking forward to it although I’m confident it will move me to a whole new level of conversation. I’ll let you know how it goes.